Top Rated Local® is pleased to announce that Hickory Stik is an award winner for restaurants in 2019. If you are looking for some out-of-this-world barbecue, look no further than this award-winning company! 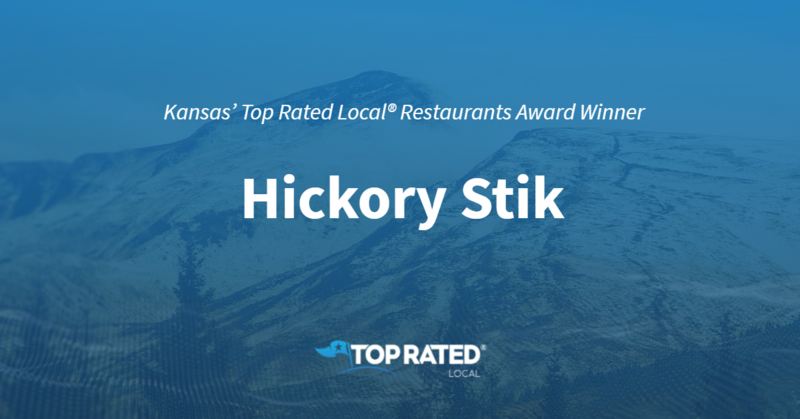 Hickory Stik has received many overwhelmingly positive reviews across five different verified sites with an average rating of 4.81 stars, earning them an impressive Rating Score™ of 98.08 and two 2019 Top Rated Local awards for ranking as one of the top 100 businesses and one of the top three restaurants in Kansas! “[I] just had lunch there with my daughter. The decor and atmosphere were nice, and the menu was easy to understand. I got a Southern Stack with a side of potato salad. It was all so good, and we didn’t have to wait long at all. I’d definitely come here again! Great job, everyone!” – R.U. It is because of excellent reviews like this that Hickory Stik is now able to call themselves a Top Rated Local award winner! We were excited to learn all about how Hickory Stik has been able to build such an impressive reputation, so we sat down with the owner, Aaron Bruce. The first thing we wanted to know was what it is that makes Hickory Stik stand apart from their local competitors. At Hickory Stik, all of the food comes from the heart, and that love also goes into the way they treat every customer. Customer service is at the front of their mission, and they want to treat every customer like family. With as impressive a reputation as Hickory Stik has, we were not surprised to hear that they love being active in their community, and will do anything they can to stay involved. They especially like to find ways to work with local schools, or to cater benefits. Congratulations to Hickory Stik for being a 2019 Top Rated Local award winner, and special thanks to Aaron for taking the time to speak with us! Top Rated Local® is pleased to announce that Genki Sushi is a 2019 award winner for restaurants in North Carolina! 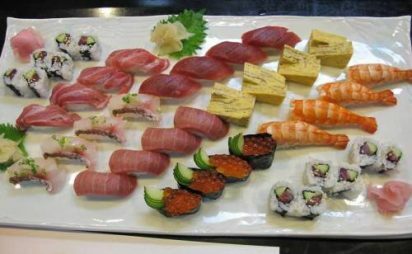 For delicious food and an unbeatable dining experience in Wilmington, choose Genki Sushi. Genki Sushi has received more than 1,200 reviews on six verified sites with an average rating of 4.82 stars, earning them a phenomenal Rating Score™ of 98.19 and a 2019 Top Rated Local award for ranking among the top 10 restaurants in all of North Carolina! “We are from out of state and planned our first night in town around coming in here, and even made reservations to be sure. We found this place by accident the last time we vacationed in Wilmington, and we knew this would bring us back. Everyone here is so friendly and clearly love the place, and it shows in all they do. The food is amazing. The caramels are so yummy, and it is such a great kickoff to our vacation. Thank you! !” – Jennica W.
Lana Ke, the owner of Genki Sushi, generously gave us a few minutes of her time to tell us about her award-winning business and its stand-out online reputation. The first question we had for Lana was what sets Genki Sushi apart from the many other restaurants in North Carolina. Lana told us that they offer top-of-the-line quality — they even turned away tuna last week because it wasn’t up to par — and that they have a strong team that works well together and is always willing to go above and beyond. Lana went on to say that, above all, Genki Sushi is competing with itself. Outside of building a powerful online reputation, Genki Sushi hasn’t done much in the way of advertising to get their name out there. Instead, they simply focus on providing service at its best, pleasing everyone and establishing a rapport with their customers, which has led to word of mouth and repeat customers. Congratulations to the team at Genki Sushi for being a 2019 Top Rated Local award winner, and thank you so much, Lana, for taking the time to speak with us! 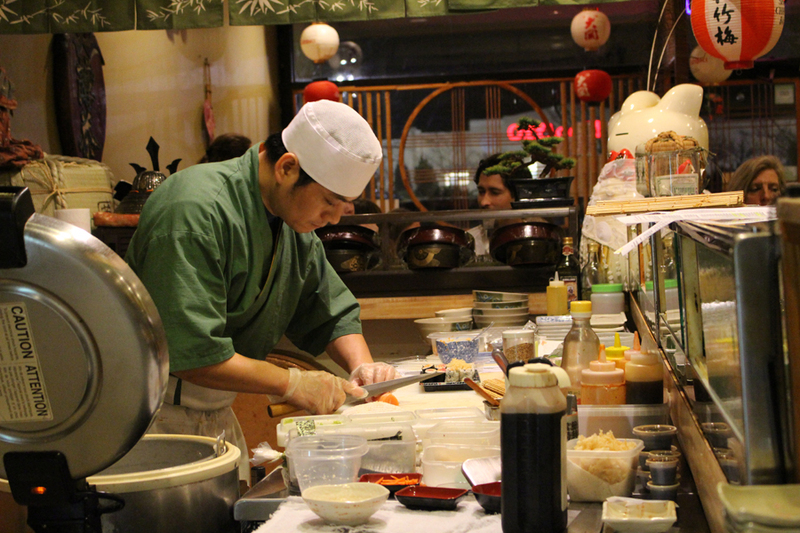 We highly recommend Genki Sushi in Wilmington. Visit their website today! 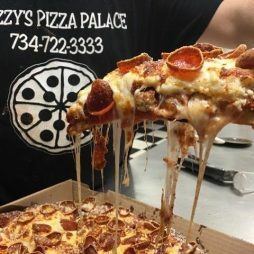 Top Rated Local® is pleased to announce that Vizzy’s Pizza Palace is a 2019 award winner for restaurants in Michigan! If you’re looking for a mouth-watering slice of pizza in Westland, look no further than Vizzy’s Pizza Palace. Vizzy’s Pizza Palace has received hundreds of reviews on six verified sites with an average rating of 4.77 stars, earning them a spectacular Rating Score™ of 97.65 and a 2019 Top Rated Local award for ranking among the top 10 restaurants in all of Michigan! “First off, the owner was absolutely awesome, so nice and friendly. But my fiancé and I have been doing the low-carb thing for a bit. We went to Vizzys for the first time and got the keto pizza with sugar-free sauce. It was AMAZING. I think I might be going once a week to get my pizza fix.” – Jamal F.
Paul Visingardi, the owner of Vizzy’s Pizza Palace, generously gave us a few minutes of his time to tell us about his award-winning business and its stand-out online reputation. Congratulations to the team at Vizzy’s Pizza Palace for being a 2019 Top Rated Local award winner, and thank you so much, Paul, for taking the time to speak with us! We highly recommend Vizzy’s Pizza Palace in Westland. Visit their website today! 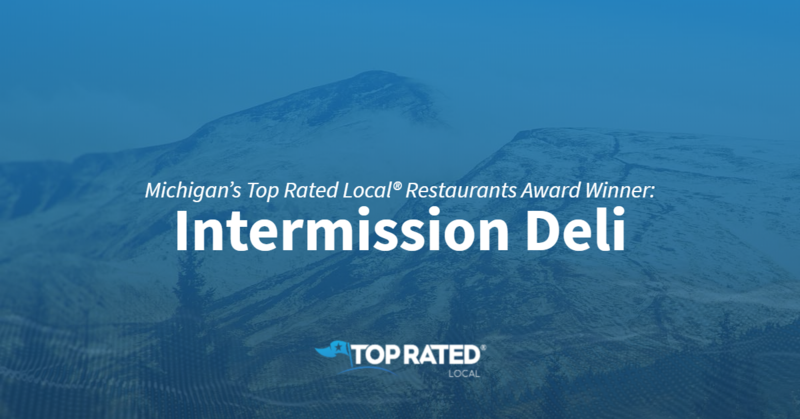 Top Rated Local® is pleased to announce that Old House Family Restaurant is a 2019 award winner for restaurants in Michigan! If you’re looking for a great dining experience in Sterling Heights, look no further than Old House Family Restaurant. Old House Family Restaurant has received hundreds of reviews on six verified sites with an average rating of 4.71 stars, earning them a wonderful Rating Score™ of 97.06 and a 2019 Top Rated Local award for ranking among the top 10 restaurants in all of Michigan! “Our server was friendly and helpful with special requests. We arrived just 45 minutes before closing for lunch, but she made us feel welcome and didn’t rush us. She gave us refills on iced tea and saw to our every need. The prices are very reasonable, and the menu has lots of choices. I had an order of the Old House Breakfast Special. It was filling and well-prepared. We will be back when we are in the area.” – Julie H.
In order to learn a little more about this one-of-a-kind restaurant and its outstanding online reputation, we took a few minutes to talk with Megan Turner, Front House Manager and Head Waitress at Old House Family Restaurant. Outside of building a powerful online reputation, Old House Family Restaurant has spread the word about who they are and what they do through word of mouth, Facebook and the sign they have out front. Other than that, Megan says that they don’t do much advertising. Congratulations to the team at Old House Family Restaurant for being a 2019 Top Rated Local award winner, and thank you so much, Megan, for taking the time to speak with us! 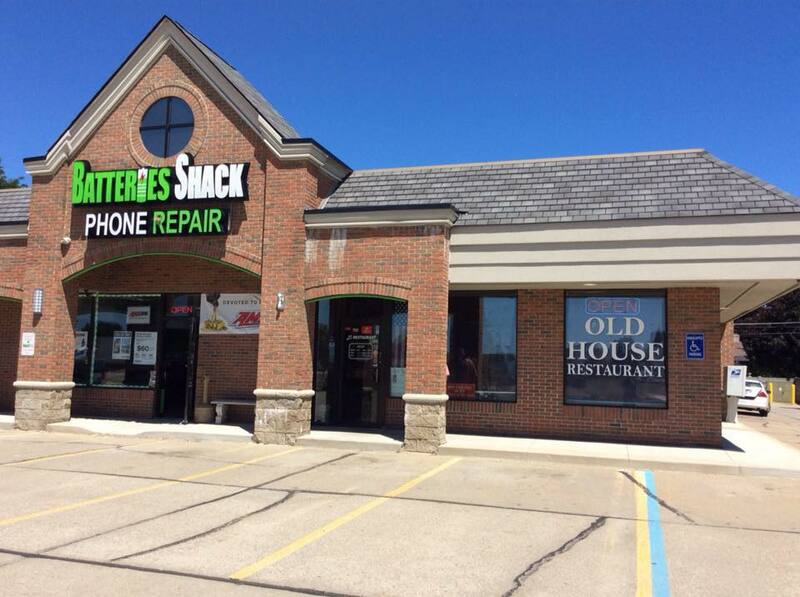 We highly recommend Old House Family Restaurant in Sterling Heights. Visit their Facebook page today! 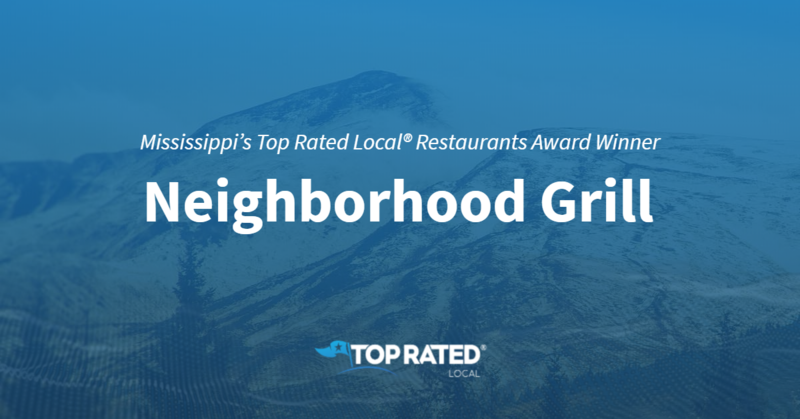 Top Rated Local® is pleased to announce that Tongue In Cheek is an award winner for restaurants in 2019. If you are looking for an upscale food experience in a casual setting, look no further than this award-winning company! 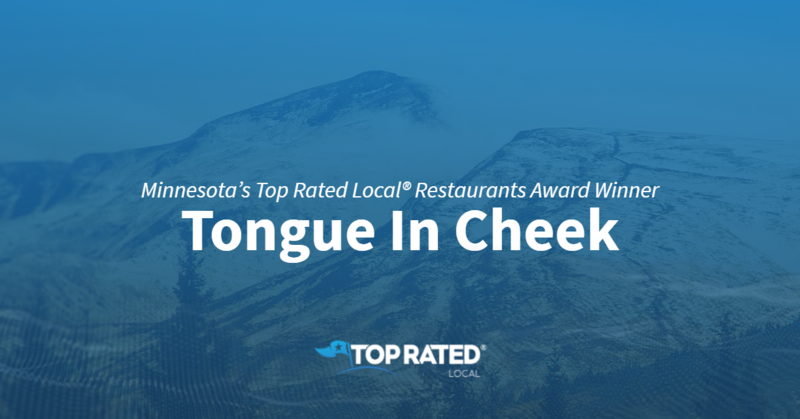 Tongue In Cheek has received thousands of overwhelmingly positive reviews across six different verified sites with an average rating of 4.66 stars, earning them an impressive Rating Score™ of 96.63 and a 2019 Top Rated Local award for ranking as one of the top 10 restaurants in Minnesota! “Tongue In Cheek does a wonderful job of pairing flavors, both [complimentary] and contrasting. Every dish is beautifully crafted for an amazing flavor adventure. It caters very well to those with allergies or eating preferences. The drinks and cocktails are incredibly well-rounded and leave you wanting to taste more. [It is] definitely worth a trip!” – L.M. It is because of excellent reviews like this that Tongue In Cheek is now able to call themselves a Top Rated Local award winner! We were excited to learn all about how Tongue In Cheek has been able to build such an impressive reputation, so we sat down with the General Manager, Ryan Huseby. As our conversation continued, we began to talk about Tongue In Cheek’s business mission. We learned that they only use sustainably and humanely sourced meats, fish, and produce. It is clear that it is not only the customer experience that they value, but also the quality of their product. Tongue In Cheek has managed to build an impressive reputation over the years, so we were excited to learn about some of the ways they have marketed their business. We learned that they do very little paid advertising, but they do love to run promotional events to bring people in. They focus on keeping their customers updated through social media. Congratulations to Tongue In Cheek for being a 2019 Top Rated Local award winner, and special thanks to Ryan for taking the time to speak with us! 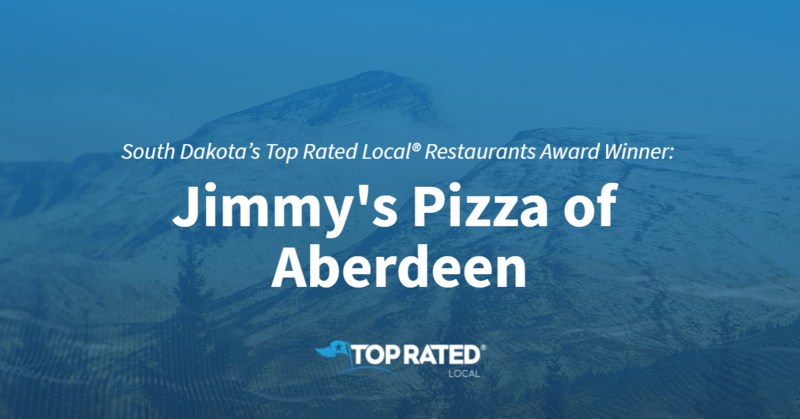 Top Rated Local® is pleased to announce that Jimmy’s Pizza of Aberdeen is two-time 2019 award winner in South Dakota! If you’re looking for a slice of pizza that can’t be beat in Aberdeen, look no further than Jimmy’s Pizza of Aberdeen. 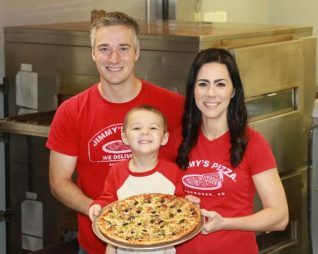 Jimmy’s Pizza of Aberdeen has received more than 150 reviews on five verified sites with an average rating of 4.72 stars, earning them a stellar Rating Score™ of 97.16 and two 2019 Top Rated Local awards for ranking among the top 100 businesses and the top 10 restaurants in all of South Dakota! “This is our favorite place to order from, and we have nothing but great things to say about Jimmy’s! We try to order a few times a month and have tried many different kinds. 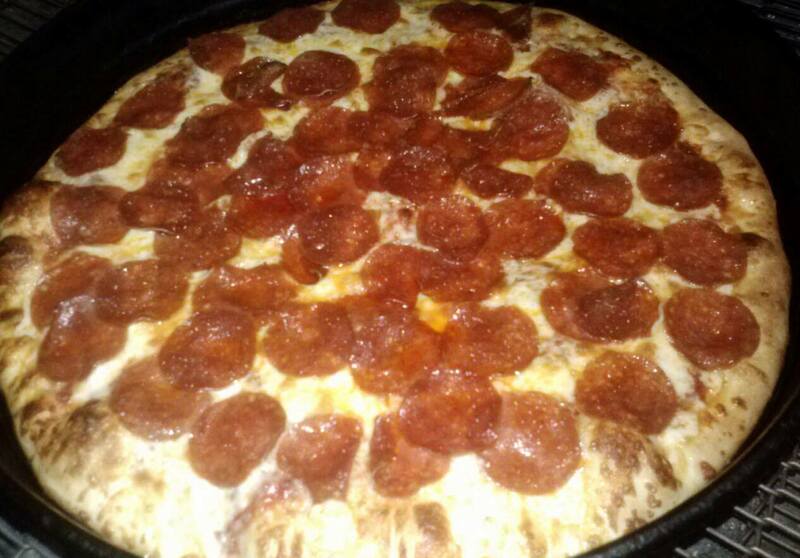 We especially love how fresh the ingredients are and that they have a great gluten-free crust! Jimmy’s is our go-to, and the owners and workers couldn’t be nicer.” – Rayli H.
Nick Schaunaman, who has been the owner of Jimmy’s Pizza of Aberdeen for two and a half years now, generously gave us a few minutes of his time to tell us a little more about his award-winning business and its stand-out online reputation. To kick off our conversation, we asked Nick what it is that sets Jimmy’s Pizza of Aberdeen apart from the many other restaurants in South Dakota. He told us that they are a locally owned and operated company that’s been in business for 10 years, and that they make the best product in town and give exceptional customer service. Nick attributes Jimmy’s Pizza of Aberdeen’s strong online reputation to their focus on creativity. Outside of building a powerful online reputation, Jimmy’s Pizza of Aberdeen has gotten their name out there through Facebook and other social media platforms, by handing out flyers and by taking a hands-on approach with potential customers. Congratulations to the team at Jimmy’s Pizza of Aberdeen for being a 2019 Top Rated Local award winner, and thank you so much, Nick, for taking the time to speak with us! We highly recommend Jimmy’s Pizza of Aberdeen. Visit their website today! 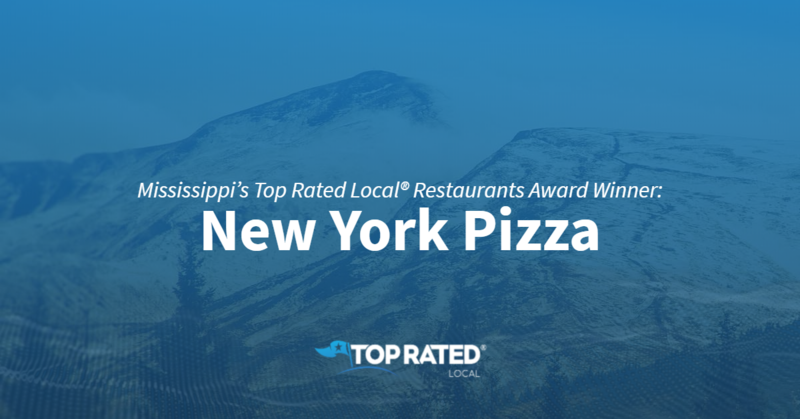 Top Rated Local® is pleased to announce that New York Pizza is two-time 2019 award winner in Mississippi! 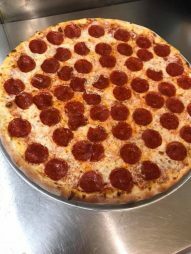 If you’re on the hunt for a mouth-watering slice of pizza in Pascagoula, you won’t find a better option than New York Pizza. New York Pizza has received hundreds of reviews on five verified sites with an average rating of 4.68 stars, earning them a remarkable Rating Score™ of 96.85 and two 2019 Top Rated Local awards for being ranked among the top 100 businesses in Mississippi and among the top 10 restaurants in Mississippi! “As a native New Yorker from Manhattan, it’s hard to find REAL New York pizza in the south, period! This little gem is, hands down, the absolute BEST I’ve EVER found. And I’ve had ‘New York’ pizza in Alabama, Georgia and Texas before I found this place. My fellow pizza snobs from NYC will understand my feelings when I say I was ecstatic to see garlic powder on EVERY table my first time here!! The pizza is AMAZING!! The staff is pleasant and helpful, and the service is fast! !” – Deirdre J.
Dale Johnson, the owner and manager of New York Pizza, generously gave us a few minutes of his time to tell us a little more about his award-winning business and its impressive online reputation. The first question we had for Dale was what sets New York Pizza apart from their competition in Mississippi. Dale points to their quality food — they get local produce from right down the street; their dough is made in-house, and their sauce is homemade — and to the amazing staff they have. We also wanted to know what their mission is at New York Pizza and how they work to make the world a better place. Dale told us that they work hard to make their customers happy and bring them back, and that they hope to expand to more locations in the future. Dale attributes New York Pizza’s strong online reputation to the fact that they are there for their customers, to the consistency they provide with every guest interaction and to their excellent, never-say-no customer service. Outside of building a powerful online reputation, New York Pizza has gotten their name out there through promotions on Facebook and regional television ads. Congratulations to the team at New York Pizza for being a 2019 Top Rated Local award winner, and thank you so much, Dale, for taking the time to speak with us! We highly recommend New York Pizza in Pascagoula. Visit their website today! 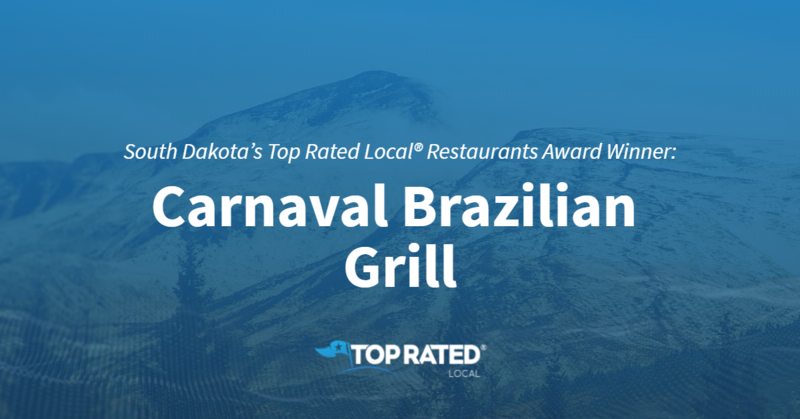 Top Rated Local® is pleased to announce that Carnaval Brazilian Grill is two-time 2019 award winner in South Dakota! For an unforgettable culinary experience in Sioux Falls, there’s no better option than Carnaval Brazilian Grill. 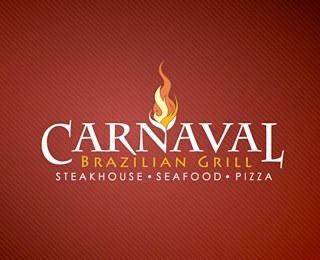 Carnaval Brazilian Grill has received thousands of reviews on five verified sites with an average rating of 4.67 stars, earning them an incredible Rating Score™ of 96.70 and two 2019 Top Rated Local awards for ranking among the top 100 business and among the top 10 restaurants in all of South Dakota! “[This is the] best place in town, hands down, for carnivores such as myself. [The] perfectly prepared beef and lamb keep me coming back. I proposed to my fiance here — the staff helped me organize a wonderful surprise proposal. I will forever be grateful for their exceptional service and help in making our big night special!” – Seth T.
We wanted to learn a little more about this one-of-a-kind restaurant and its impressive online reputation, so we took a few minutes to talk with Roman Craigle, the manager of Carnaval Brazilian Grill. The first question we had for Roman was what sets Carnaval Brazilian Grill apart from other restaurants in South Dakota. He points to their entertaining atmosphere, to the fact that they are locally owned and to their continued commitment to being the best people with the best food possible. Roman attributes Carnaval Brazilian Grill’s strong online reputation to their commitment to making smiles and memories, and to the fact that they’ve been pushing the best customer service for the 14 years they’ve been open. Outside of building a powerful online reputation, Carnaval Brazilian Grill has spread the word about who they are and what they do through word of mouth and magazines. Congratulations to the team at Carnaval Brazilian Grill for being a 2019 Top Rated Local award winner, and thank you so much, Roman, for taking the time to speak with us! We highly recommend Carnaval Brazilian Grill in Sioux Falls. Visit their website today!